As you might know from previous posts, this January I met with the religious education director at church to find out more about RCIA and have started the process of becoming Catholic. Although I had become somewhat familiar with Mass and the Catholic faith by attending Christmas and Easter Masses, I had only really scratched the surface. I had never really attended a “regular Mass”, just the special ones, or as part of a Baptism, wedding or funeral. And although I had participated somewhat in Lent in the past by giving up something and abstaining from meat on Fridays, I had never really grasped the meaning of it all until this year. 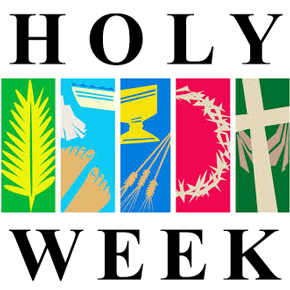 I was pretty excited about Holy Week this year, since it is such an important week in the Catholic faith. I had emailed the religious education director at the beginning of Lent to learn more about the meaning of each special day (Ash Wednesday, Palm Sunday, Holy Thursday, Good Friday, etc. ), and she had made a suggestion to me after sending me links to more information to answer my questions. She explained that on Holy Thursday, the priest washes the feet of 12 parishioners, just as Jesus did at the Last Supper with his 12 disciples. She asked if I would be interested in being one of those 12 people, because it would be a good experience for me as someone coming into the church that had never experienced Holy Week before. I was hesitant at first, but eventually I agreed to do it, and I am so glad that I did. A few weeks before Holy Week, my sister-in-law (who will be my sponsor when I go through RCIA) introduced me to our priest and told him that I was getting my feet washed. He joked about how everyone’s feet look so nice and smell so nice on Holy Thursday, like they go the extra mile with perfume and powder that night. I booked a pedicure the next day for the Saturday before Holy Week. My husband attended Mass with me on Holy Thursday, which is always nice since he usually doesn’t go to Mass (funny, since he’s the Catholic one!). A friend from my work also came, and of course my husband’s family was there. Everyone joked about my pretty pedicure and how hopefully everyone’s feet didn’t stink, blah blah blah. I thoroughly enjoyed the readings at Mass – about Passover and about the Last Supper and Jesus washing his disciples feet. Then it came time for my feet to be washed. It was a solemn experience, with the choir and the parish singing, Father washing our feet. The water was warm and Father was very gentle and humble. After he washed my feet, I caught my sister-in-law’s eyes (she sings in the choir) and her face was filled with joy. She looked proud of me and excited for me, as if my journey now had truly begun. On Good Friday, I attended the Veneration of the Cross service at work. I am fortunate enough to work at a Catholic nursing home with a Chapel in the building, and our administrator (who is a nun) offered to all staff to attend the service. I went with my co-manager, who also converted to Catholicism as an adult. Our administrator of course was there, along with some of her Sisters. I had never attended this service before, and wasn’t quite sure what to expect or what I would do. I was overwhelmed with emotion as I watched my elderly residents kissing and touching the cross, showing so much love and gratitude for the sacrifice of our Lord. When it was my time to go up to the cross, I knelt down and kissed Christ’s feet, and in my heart thanked Him for his sacrifice. I was filled with this different feeling… a feeling of joy, excitement, nervousness, relief. I realize now, that feeling was the Holy Spirit in me. After the service was over, Sister came and visited my co-manager and me in the kitchen. She introduced me to her Sisters and explained to them that I was on my way to becoming Catholic. She was beaming from ear to ear. Another person who has been proud and excited that I am choosing to join this faith. We attended Easter Vigil as usual, but I knew it was going to be different for me this time. In the short time that I have been attending Mass on a regular basis and reading scripture, I have learned so much! I have truly opened my heart to Jesus, and I knew that it would mean a very different experience for me on Easter Vigil. Come to find out, it was our Priest’s first Easter Vigil at our church, too, so it meant that Mass was going to truly be different than it had ever been for me before. I realized how much I had missed the Alleluia during Lent, and I sang and prayed my heart out. When the two Catechumens were baptized, confirmed and received first communion, I was emotional as usual but I also felt more excitement. I knew that next year, that would be me! The biggest part that I will take away from Holy Week this year is how close it made me feel to my family, my friends, my coworkers, my church and of course my Lord and Savior, Jesus Christ. I sometimes still feel awkward, almost like I don’t belong, when I attend Mass. I even felt that way on Holy Thursday sitting at the front of the church, and at the Chapel at work on Good Friday. But after having so many people come to me and express such joy and excitement for me, and having felt my heart growing closer to God, I feel less awkward. I feel like I belong, and like I am part of something wonderful. And I truly am.